The purpose of this in vitro study was to compare the internal gaps of 3 different full molar crowns prepared using digital and conventional impression techniques. A zirconia model with a prepared maxillary first molar was used as the base model. Sixty crown restorations were produced using zirconia, polyether ether ketone and hybrid ceramic from the same datasets. The specimens divided into 2 groups that were fabricated as follows: for the group conventional impression (CZ; CP; CH, n=10), vinyl siloxane ether impressions of the master model were made. For the group digital impression (DZ; DP; DH, n=10), digital impressions of the master model using intraoral scanner system were made. The internal accuracy of the frameworks were measured under a reflected stereo microscope by using the silicon replica technique. ANOVA and the Tukey-HSD multiple comparison tests were used. There was no significant statistical difference between the conventional and digital impression techniques in relation to the internal fit (p>0.05). Group DH (81.74 μm) showed the lowest values for internal fit, while group CZ (102.2 μm) showed the largest. Within the limitations of this in vitro study, it was concluded that the marginal fit produced by the digital and conventional impression techniques showed the same values, and all the samples were measured at a clinically acceptable internal fit (<200 μm). Dental treatment is moving toward digital technology (1). For 30 years, computer-aided design and computer-aided manufacturing (CAD/CAM) has been used to fabricate fixed dental prostheses (FDPs) in digital dentistry (2). Today, many framework materials for FDPs are fabricated using CAD/CAM technology, such as zirconia, high-resistance polymers (polyether ether ketone), and hybrid ceramic restorations, which use mechanical properties and biocompatibility to provide sufficient mechanical resistance to chemical attacks and to determine clinical success (3-6). Internal adaptation is a key factor in the clinical success of dental restorations (7). The precision of the details is critical in terms of model accuracy, and the internal fit influences preconditions for the clinical performance of the indirect restorations (8-12). When referring to the fit between the teeth and the restoration, the existing restoration is referenced as the internal fit. Poor internal fit of indirect restorations can cause distribution of the microflora and can increases plaque retention (13), which can lead to the occurrence of secondary caries, microleakage, pulpitis, and periodontal diseases (13-16). It also will weaken the fracture strength and mechanical properties of the restorations (9,17,18). The type of impression material and impression technique used will affect the internal fit of a prosthetic restoration. The conventional impression technique is used as a standard in prosthetic dentistry, owing to its ease of application, adequate stability and precision, low cost, and the short time required to perform the procedure (19,20). However, this technique relies upon impression materials and master dies, so the potential for distortion of the impression material exists (21-23). Deformation and errors caused by impression materials (such as expansion or shrinkage) will affect the accuracy of the master die and can jeopardize the fit of the FDP (24). Christensen (25) emphasized that more than 50% of measurements obtained by the conventional impression technique cannot be used to determine an acceptable internal fit due to errors caused by the impression materials. In addition, prostheses produced from an unclear impression recording are not compatible with dental tissue (25). Researchers have worked to improve the process of creating impression materials by seeking out a more accurate method for dental impressions. Therefore, the digital impression technique was developed to address this need by increasing the accuracy of the definitive FDP while simplifying the process (26). The advantage of digital impressions is that they involve faster lab processing than conventional impressions, the data can be stored indefinitely, and the images can be transmitted digitally (27). In addition, the digital impression technique increases patient comfort, reduces errors caused by impression materials, provides three-dimensional visual analysis between physicians and patients, and generates higher profits by reducing costs associated with the creation of dental prosthetics (28). 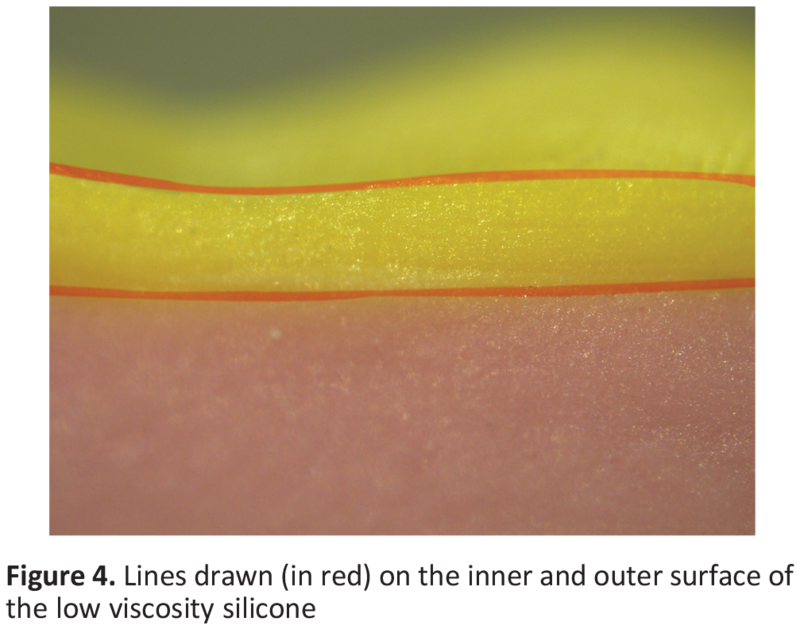 Despite these advantages, the digital impression technique cannot provide a clear bit recording in the subgingival region and can cause a reduced sensitivity to blood and saliva (29,30). Previous studies have evaluated the precision of an intraoral scanner and have revealed that similar or more accurate results could be achieved compared to those produced by conventional vinyl siloxane ether or silicon impression materials (13,14), while other studies have reported that scanners are less accurate than conventional impressions (22). As a result, there is no consensus about which impression technique is better in terms of internal accuracy (31). The purpose of this study was to compare and evaluate the internal adaptation of framework fabrication using two impression techniques, and it was hypothesized that there would be no difference in the clinical internal fit of framework when either an intraoral scanner or a vinyl siloxane ether impression material has been utilized to develop an impression technique. In the present study, a zirconia base model (Zirconia Pre Shaded Blank; Shenzhen Upcera Co, Shenzhen, Yuè, China) with a prepared maxillary first molar, which included a minimum occlusal reduction of 2.0 mm, an axial reduction of 1.5 mm and a chamfer with convergence angle of 6 °C (Figure 1). In this model, crowns were produced using the digital and conventional impression technique and 3 different materials. The materials were fabricated from zirconia, high resistance polymer (PEEK Optima LT1, In vivo Biomaterial Solutions Inc, Lancashire, England), and hybrid ceramics (Cerasmart; GC America Inc, Alsip, IL, USA). A total of 10 crowns were preferred for each group. In total, 60 molar full crowns were produced using the CAD/CAM system machine (Yena D15; Turkuaz Inc, İzmir, Turkey). The ethics committee approval was not necessary since the study was in vitro. First, conventional impression with a vinyl siloxane ether (GC Exa'lance; GC America Inc, Alsip, IL, USA) of the zirconia model were made using custom trays. According to the manufacturer, the impression material requires 6 min to set fully. Due to the controlled room temperature of this study, the setting time was extended for about 2 min to a total time of 8 min. Twenty-four hours later, The master cast was fabricated with a type I4 stone (Fujirock; GC America Inc, Alsip, IL, USA). The stone cast was scanned with a model scanner (Dental Wings 7 Series; Dental Wings Inc, Montréal, QC, Canada) and all data were transferred and saved as an stereolithography (STL) file. Subsequently, each CAD process STL file was sent and the design of the 30 frameworks was performed: 10 frameworks were produced from polyether ether ketone (CP), 10 frameworks were produced from zirconia (CZ), and 10 frameworks were produced from hybrid ceramic (CH). The complete the design of the frameworks required the use of a 3-axis milling machine. Zirconia frameworks were sintered at a temperature of 1500 °C to full density in a sintering furnace (Lava Furnace 200; 3M ESPE, St. Paul, MN, USA). However, only surface polishing processes were applied to the PEEK and Cerasmart frameworks without any sintering process. The zirconia base model was scanned using the CEREC 3 intraoral scanner (Cerec Omnicam; Sirona Dental Systems Inc. NY, USA). According to the manufacturer, no powder system was needed on the zirconia model before scanning. The same parameters were used for both impression techniques during production. Thus, the aim was to produce the frameworks to the same standards for the 3 different materials obtained by both impression techniques, and all the frameworks were produced using the same CAM device. 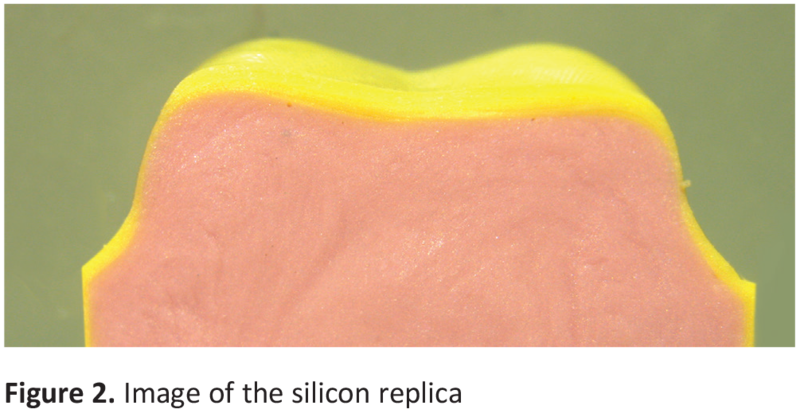 The silicon replica technique was applied for measurement values of the internal gaps of the frameworks, which were filled with extra-light body silicon (yellow color) and were placed onto zirconia base model with a dynamometer pressure of 30 N. The frameworks were removed from the base model with extra-light body silicon. Then light body silicon (pink color) was also mixed to fill circumferentially the inside of thin extra-light body silicone of each crown. The replica specimen was removed from the frameworks, after setting the light body silicon had set. The replicas were sectioned with a razor blade throughout the mesio-distal directions (Figure 2). 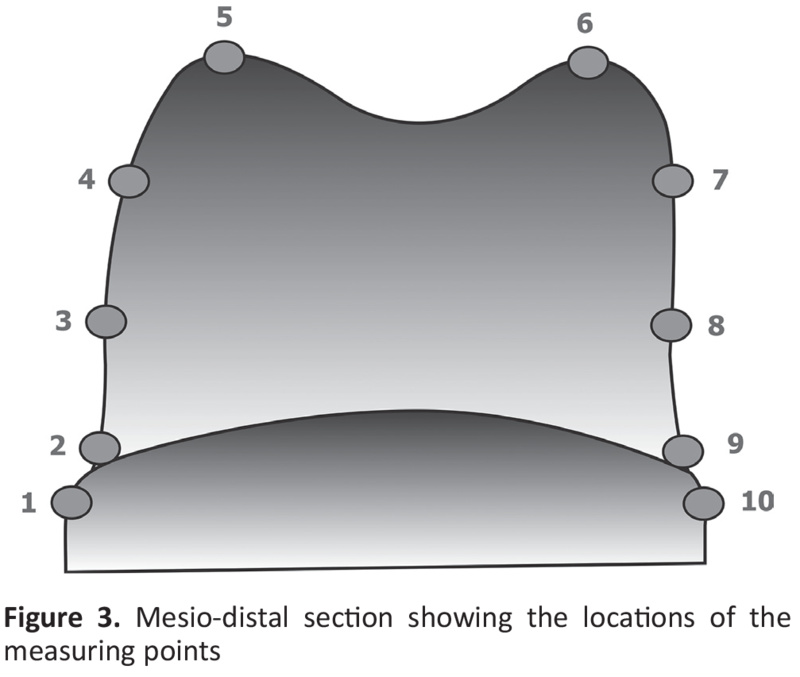 Ten different points (four marginal, four axial, two occlusal) were evaluated on the mesio-distal sections of each specimen (Figure 3). All points were measured three times by the same operator, and the mean values for each point were recorded. When measuring the internal gap, reference points were chosen, as described by Martins et al. (11). In total, 600 measurements were performed on the 60 frameworks. The replicas were examined at ×40 magnification under a reflected stereo microscope (Olympus Dp25; Olympus Corporation, Tokyo, Japan). The distances in the designated regions were calculated using the computer software (Adobe Photoshop CS; Adobe Systems Inc. San Jose, CA, USA), and the internal gap values were recorded in terms of micrometers (Figure 4). All measurements were presented descriptively by means, standard deviation (SD) and the corresponding 95% confidence intervals (95% CI). Kolmogorov-Smirnov test was applied to test the data on the normal distribution within the groups. 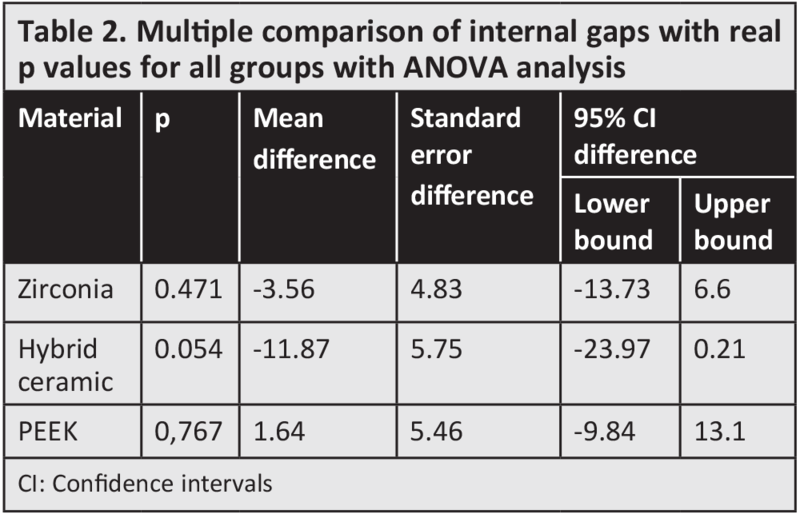 One-Way ANOVA test was used to compare the mean values, and the Tukey-HSD multiple comparison tests were used to determine how the material differed with regard to statistical significance. The internal range average, minimum and maximum values, SDs, and standard errors for each group are shown in Table 1. The values obtained by the impression techniques were statistically compared using the One-Way ANOVA and Tukey-HSD multiple comparison tests (Table 2). Within one framework material, different impression techniques showed in different distances between the manufactured frameworks and the zirconia model. For all groups, the minimum mean values were 0 μm, and the maximum mean values were 120 μm (Figure 5). The zirconia group (CZ) revealed the highest mean value (102.22 μm) for the internal gap, while the lowest mean value (81.74 μm) of the internal gap was observed in the hybrid ceramic group (DP) (Figure 5). However, there was no significant differences in internal discrepancy were found between the digital impression group and digital impression group for the all materials (p>0.05) (Table 2). The purpose of the present study was to compare the internal fit of frameworks fabricated with conventional and digital impression techniques. The null hypothesis was accepted, as no differences would be found in internal fits among the frameworks fabricated with the both techniques. In this study, based on the benefit of noninvasive and nondestructive method of the silicon replica technique, which has been reported to yield discrepancy measurements comparable with those of conventional cementation, was preferred (13,14,17). Several techniques can be used with the silicone replica technique for internal gaps measurement. Ueda et al. (14) used light microscopy to determine the internal gaps. Colpani et al. (10) compared the weight of silicone replicas to evaluate the adaptation of indirect restorations. They showed that evaluating the internal gaps could be done by comparing the weights of the replicas. 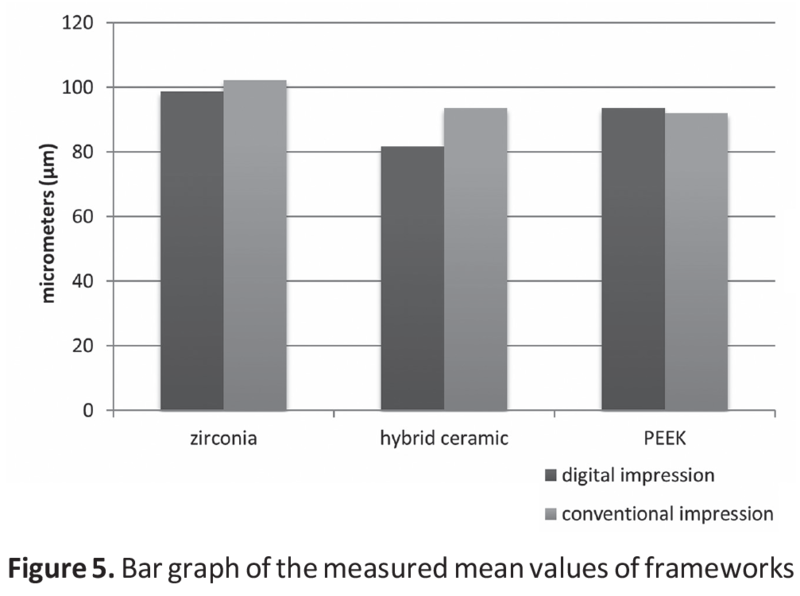 In this study, the internal gap values of the PEEK and hybrid ceramic groups are similar, although the zirconia groups were found to have higher values. It is believed that the semi-sintered zirconia used in this study is due to the dimensional change in the sintering process which is characterized by a high sintering shrinkage, of circa of 20-30% that must be compensated in the milling procedure (15). Ueda et al. (14) concluded that this procedure might negatively influence the final dimension of the restoration, and this present study found the same result for zirconia groups. On the other hand, PEEK and hybrid frameworks are milled without a sintering process. Yildiz et al. (15) evaluated the internal and fit of the zirconia frameworks fabricated with the digital impressions and the conventional impressions, and they pointed out that the increase in the internal and marginal gap values of the obtained crowns may be due to the dimensional change after the sintering. This in vitro study revealed a mean internal gap of 95.95 µm for the conventional digital impression groups and 91.35 µm for the digital impression groups. Although both groups have shown clinically acceptable values for internal fit, the better overall fit of the digital impression group could be explained by error caused by the procedure of conventional impression technique. In which, stone casts were produced from impressions made from the original zirconia model. However, no significant differences were found between frameworks fabricated with both impression techniques. For all the groups, the highest values for the internal gaps were calculated in the occlusal region, while the lowest values of internal gaps were calculated in the margin and axial region. According to published literature, the occlusal surface seems to be affected by factors that can be speculated as being problems related to the accuracy of the optical images acquired, which are not consistently reliable (11,12,15). Kokubo et al. (12) have reported that the scanner sensitivity of the CAD/CAM system affects the internal fit of the restoration that is achieved. They reported that the internal gaps of the crowns produced by the CAD/CAM system are largest in the occlusal region and smallest in the proximal and marginal regions. Theoretically, the internal gap necessary for the cement is 20-40 µm; however, in the clinical condition, this range is very rare (14). Some researchers have proposed that clinically acceptable value for maximum internal discrepancy ranging between 200 µm and 300 µm is also appropriate (16-18). In this study, although the internal gaps’ values were designed to be 30 μm, the values obtained were calculated at the upper limit. However, the calculated internal gaps values were calculated below the clinically acceptable values determined in previous studies (12-14). Ueda et al. (14) evaluated the marginal gaps of zirconia frameworks fabricated with using conventional impressions of the fit after making digital impressions. They showed no significant differences between the crowns produced by means of the conventional impression technique (mean, 141 μm) and the digital impression technique (mean, 121 μm). A recent report by Almeida e Silva et al. (23) investigated the internal fit of the zirconia frameworks produced on the basis of conventional impressions technique and digital impressions technique and no significant differences were seen between the impression techniques. Syrek et al. (13) compared the accuracy of the impression techniques, and the digital impression technique showed a significantly better internal accuracy than the conventional impression technique. The digital impressions mean was 49 μm, and the conventional impressions mean was 71 μm (p<0.05). Ender and Mehl (22) reported that the conventional impression technique is more accurate and reliable than the digital impression technique in their study. The digital impression technique and the conventional impression technique performed similarly in the CAD/CAM. However, the digital impression technique has been demonstrated to be preferable as an alternative to the conventional impression technique because of its short-time workflow, economy gains, and improvement in patient comfort. Within the scope of this in vitro study, the following conclusions were drawn; the internal fit of the crowns produced by the conventional and digital impressions method showed no statistically significant difference for each materials. All groups fabricated using digital impression technique and conventional impression technique showed a clinically acceptable internal fit. Additionally, in all the groups, the internal gaps were the smallest in the axial area, whereas the occlusal areas of the internal gaps were the largest. However, the results of this study might not reflect the reality of in clinic conditions. The results we obtained for all these should be supported by in vivo studies. Moreover, this study evaluated only 1 type of prosthesis. Studies assessing partial FDP fabricated from digital and conventional impressions should be conducted. Ethics Committee Approval: The ethics committee approval was not necessary since the study was in vitro. Informed Consent: For this type of study, formal consent is not required. Surgical and Medical Practices: B.K.T., E.A., E.G.B., Concept: B.K.T., E.G.B., Design: B.K.T., E.G.B., Data Collection or Processing: B.K.T., E.A., E.G.B., Analysis or Interpretation: B.K.T., E.A., E.G.B., Literature Search: B.K.T. E.A., Writing: B.K.T., E.G.B. Rekow ED. Dental CAD/CAM systems: a 20-year success story. J Am Dent Assoc 2006; 137(Suppl 1): 5-6. Su TS, Sun J. Comparison of marginal and internal fit of 3-unit ceramic fixed dental prostheses made with either a conventional or digital impression. J Prosthet Dent 2016; 116: 362-7.
de Kok, Kleverlaan CJ, de Jager N, Kuijs R, Feilzer AJ. Mechanical performance of implant-supported posterior crowns. J Prosthet Dent 2015; 1141: 59-66. Lameira DP, Buarque e Silva WA, Andrade e Silva F, De Souza GM. Fracture strength of aged monolithic and bilayer zirconia-based crowns. Biomed Res Int 2015; 2015: 418641. Dirxen C, Blunck U, Preissner S. Clinical performance of a new biomimetic double network material. Open Dent J 2013; 6: 118-22. Stawarczyk B, Beuer F, Wimmer T, Jahn D, Sener B, Roos M, et al. Polyetheretherketone-a suitable material for fixed dental prostheses? J Biomed Mater Res B Appl Biomater 2013; 101: 1209-16. Tinschert J, Natt G, Hassenpflug S, Spiekermann H. Status of current CAD/CAM technology in dental medicine. Int J Comput Dent 2004; 7: 25-45. McCabe JF, Carrick TE. Rheological properties of elastomers during setting. J Dent Res 1989; 68: 1218-22. Abduo J, Lyons K, Swain M. Fit of zirconia fixed partial denture: a systematic review. J Oral Rehabil 2010; 37: 866-76. Colpani JT, Borba M, Della Bona A. Evaluation of marginal and internal fit of ceramic crown copings. Dent Mater 2013; 29: 174-80. Martins LM, Lorenzoni FC, Melo AO, Silva LM, Oliveira JL, Oliveira PC, et al. Internal fit of two all-ceramic systems and metal-ceramic crowns. J Appl Oral Sci 2012; 20: 235-40. Kokubo Y, Nagayama Y, Tsumita M, Ohkubo C, Fukushima S, Vult von Steyern P. Clinical marginal and internal gaps of In-Ceram crowns fabricated using the GN-I system. J Oral Rehabil 2005; 32: 753-8. Syrek A, Reich G, Ranftl D, Klein C, Cerny B, Brodesser J. Clinical evaluation of all-ceramic crowns fabricated from intraoral digital impressions based on the principle of active wavefront sampling. J Dent 2010; 38: 553-9. Ueda K, Beuer F, Stimmelmayr M, Erdelt K, Keul C, Güth JF. Fit of 4-unit FDPs from CoCr and zirconia after conventional and digital impressions. Clin Oral Investig 2016; 20: 283-9. Yildiz C, Vanlioğlu BA, Evren B, Uludamar A, Ozkan YK. Marginal-internal adaptation and fracture resistance of CAD/CAM crown restorations. Dent Mater J 2013; 32: 42-7. Kohorst P, Brinkmann H, Li J, Borchers L, Stiesch M. Marginal accuracy of four-unit zirconia fixed dental prostheses fabricated using different computer-aided manufacturing systems. Eur J Oral Sci 2009; 117: 319-25. Boening KW, Wolf BH, Schmidt AE, Kästner K, Walter MH. Clinical fit of Procera AllCeram crowns. J Prosthet Dent 2000; 84: 419-24. Suárez MJ, González de Villaumbrosia P, Pradíes G, Lozano JF. Comparison of the marginal fit of Procera AllCeram crowns with two finish lines. Int J Prosthodont 2003; 16: 229-32. Rubel BS. Impression materials: a comparative review of impression materials most commonly used in restorative dentistry. Dent Clin North Am 2007; 513: 629-42. Hondrum SO. Changes in properties of nonaqueous elastomeric impression materials after storage of components. J Prosthet Dent 2001; 85: 73-81. Tamim H, Skjerven H, Ekfeldt A, Rønold HJ. Clinical evaluation of CAD/CAM metal-ceramic posterior crowns fabricated from intraoral digital impressions. Int J Prosthodont 2014; 27: 331-7. Ender A, Mehl A. Accuracy of complete-arch dental impressions: a new method of measuring trueness and precision. J Prosthet Dent 2013; 109: 121-8. Almeida e Silva JS, Erdelt K, Edelhoff D, Araújo É, Stimmelmayr M, Vieira LC, et al. Marginal and internal fit of four-unit zirconia fixed dental prostheses based on digital and conventional impression techniques. Clin Oral Investig 2014; 18: 515-23. Wöstmann B, Rehmann P, Trost D, Balkenhol M. Effect of different retraction and impression techniques on the marginal fit of crowns. J Dent 2008; 36: 508-12. Christensen GJ. The state of fixed prosthodontic impressions: room for improvement. J Am Dent Assoc 2005; 136: 343-6. Abdel-Azim T, Rogers K, Elathamna E, Zandinejad A, Metz M, Morton D. Comparison of the marginal fit of lithium disilicate crowns fabricated with CAD/CAM technology by using conventional impressions and two intraoral digital scanners. J Prosthet Dent 2015; 114: 554-9. Kim SY, Kim MJ, Han JS, Yeo IS, Lim YJ, Kwon HB. Accuracy of dies captured by an intraoral digital impression system using parallel confocal imaging. Int J Prosthodont 2013; 26: 161-3. Christensen GJ. Impressions are changing: deciding on conventional, digital or digital plus in-office milling. J Am Dent Assoc 2009; 140: 1301-4. Galhano GÁ, Pellizzer EP, Mazaro JV. Optical impression systems for CAD-CAM restorations. J Craniofac Surg 2012; 23: 575-9. Boeddinghaus M, Breloer ES, Rehmann P, Wöstmann B. Accuracy of single-tooth restorations based on intraoral digital and conventional impressions in patients. Clin Oral Investig 2015; 19: 2027-34. Mörmann WH. The evolution of the CEREC system. J Am Dent Assoc 2006; 137(Suppl): 7-13.